If you are eagerly waiting for the all new Samsung Note, here are some confirmed rumors about the launch of this next generation phablet. 1 . Previous speculations of Samsung, ditching the number’6′ in the lineup of Galaxy Note, is now confirmed and the new device is named as Samsung Galaxy Note 7! 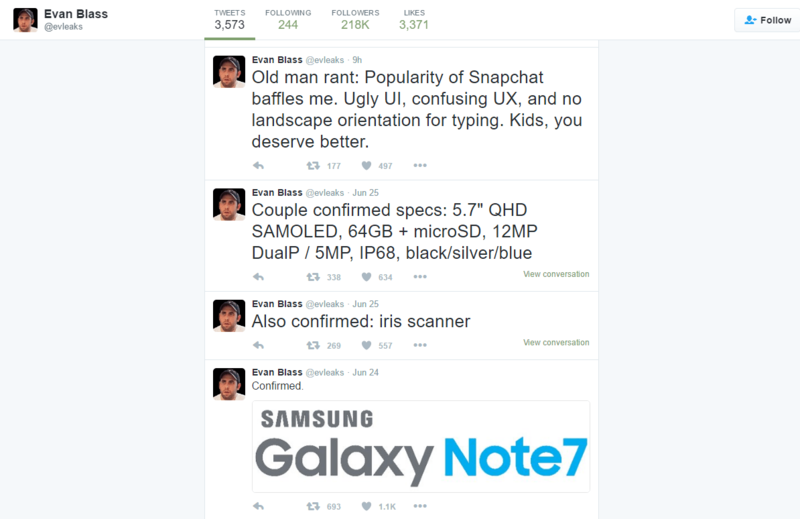 This rumor has been confirmed by the smartphone leak expert – Evan Blass! Note 7 will come with a bigger battery and monstrous RAM! Evan himself has confirmed that Note 7 is to come with 4000 mAH battery and 6GB of RAM. Even the budget smartphone from Asus like the Zenfone Max comes with 5000 mAH, so not sure what Samsung will achieve from his small upgrade. Minute specifications like the 5.7-inch Quad HD Super AMOLED display, internal storage of 64GB & a microSD expansion slot has also been confirmed by the series of tweets by the same source. If the QuadHD rumor is true, we might have to wait for next generation of Galaxy devices for the ultraHD 4K VR-ready displays that Samsung showcased recently. Another leak star ‘SamMobile’ has hinted that this launch will happen on August 2nd, in a recent tweet. So the launch is just around the corner, and we can expect Samsung to start pre-orders in mid-July. Last and the most important leak that has been confirmed is, Samsung is going ahead with the Iris technology, meaning you can unlock your Galaxy Note 7 with just a glance! This has been expected for months now, and if Samsung really goes ahead with it, then Note 7 will be the first of its kind flagship you can buy! So that’s all from the Samsung Rumors that has been confirmed from multiple trusted sources. Like this video, share and subscribe to Digital Conqurer for more tech news! LeEco Le 2 – 10 Interesting Things You Should Know!